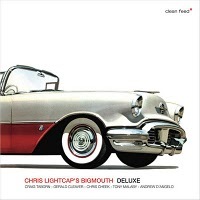 “Deluxe,” the superb new recording by bassist Chris Lightcap and his group Bigmouth, a quintet that has played together since 2005, is emblematic of a few trends on the local jazz scene. The album features several first-tier New York musicians— saxophonists Tony Malaby, Chris Cheek and Andrew D’Angelo, drummer Gerald Cleaver and keyboardist Craig Taborn—and is the first recording by Mr. Lightcap’s group in nearly eight years. It was done for Portugal’s Clean Feed label, which has picked up the slack as many American labels reduce their output of new jazz. As domestic jazz recording has declined, so have the opportunities for the next wave of greats to play on the best-known stages in jazz. To get exposure, they have turned to smaller places instead. On Thursday, Bigmouth will perform at the Stone, an artist-run space in the East Village. Mr. Lightcap, who is 39, has played with avant-garde and mainstream groups since arriving in New York in the early 1990s. His primary sideman gigs now are with violinist Regina Carter and her Reverse Thread group, which blends jazz and African music; and with such leading musicians as pianist James Carney, guitarist Ben Monder, drummer Matt Wilson and Circle Down—a group led by drummer Chad Taylor. Ms. Carter first heard Mr. Lightcap at a rehearsal with saxophonist Dave Rogers 11 years ago. “The charts were rhythmically challenging,” she said, “but Chris’s playing was assertive and motivating.” She added that she was impressed by the sound he achieved without amplification. It is Mr. Lightcap’s sound—big and elastic—that makes “Deluxe” so appealing. Most bassists provide the musical ground for their bandmates from behind, but Mr. Lightcap’s combo features his sound out front with no loss of unity. Messrs. Malaby and Cheek’s two tenor saxophones are out front, too, creating soaring harmonies and incisive, contrasting solos. Mr. Lightcap said the band’s structure grew out of his experiences here in the late ’90s. “I played in a lot of trios—usually bass, drums and sax—without a chordal instrument because a lot of rooms didn’t have a good piano,” he said. That led him to start thinking about a group with no piano and more saxophones on the front line; his first two recordings as a leader were in a two-sax, bass and drum quartet. A native of Latrobe, Pa., Mr. Lightcap studied piano and violin as a child, but didn’t become passionate about playing until he took up the bass as a teenager. He attended the Governor’s School of the Arts, a Pennsylvania program for aspiring musicians. “I was the only bassist, so I got to play everything,” he said.